There it is, the remains of my workbench. It was a relatively simple, but dirty, job retrieving it from the mud, with the help of a chain block. I'm not sure wether or not I should be pleased that there no pictures of me in my waders, all covered in mud. The worst bit though was definitely the smell. 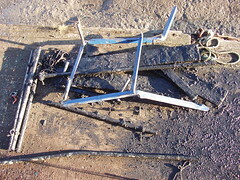 That twisted blue metal you can see in the picture was once the frame, with what remains of the scaffold tubing, covered in mud, scattered about. You can only just make out the broken bits of board, caked in mud, on the platform which itself is now slippery underfoot with that black mud. I tried washing off the mud using buckets of water, but just made a worse mess of everything, including getting black mud on my new paint. I think a jetwash is going to be the only answer. They say that pride comes before a fall, and I was once so proud of that workbench. Ah well, the next one will be better. I don't know about you, but I'm all ready for Christmas. Needless to say, blogging is likely to be a little sporadic between now and the new year. A very happy Christmas/Holiday season to one and all. The photo says it all really. 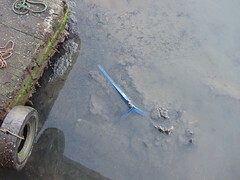 This was taken from Lady Jane, looking down at the mud with the tide just starting to come back in. Before even trying anything, I invested in a pair of waders similar to these. As it turns out that was a good move. You have no idea just how gross that mud is. It's jet black, thick, slimy and stinks unbelievably! I previously justified the expense of the waders with the thought that they would be invaluable when launching and recovering the rib, as I inevitably end up wet on shallow ramps. Having only taken a few steps in the mud, buying them for this recovery operation is fully justified in it's own right. I had to be hosed off like some big muddy thing afterwards. Anyway this is recovery blog entry one, as I managed to get a rope on the thing that was my workbench, but failed to pull it clear using the boat and the rising tide. It's now sitting back in the mud, albeit a little bit higher than you can see in this picture. For my next attempt I'll use a chain block. Something Robin suggested and I should have thought of earlier. 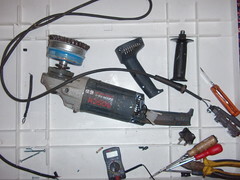 My trusty ol angle grinder also broke last week. I'm not really surprised at it having some sort of problem, as it has not exactly had an easy life, given that it's been used to wire brush pretty much all of the surfaces that I've painted so far. After initially suspecting the switch, I finally traced the problem back to a broken wire in the power cord. 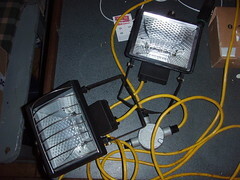 With a shorter cable and a new plug, purchased yesterday, all should be back to normal with the grinder. I certainly hope so, as it's probably the most used power tool on board at the moment. I've now started painting the wheelhouse white. The difference, even with only a first coat, is amazing. Things have been going too well for me just recently, but all that has suddenly changed. Just as I was finishing painting with the batch of Hempel white epoxy paint I had mixed, the temperature dropped to below freezing. Common wisdom from the folks at the marina across from Lady Jane is that the paint won't set now, as it was too cold. I'm hoping otherwise. To add insult to injury, I also discovered that my workbench had disappeared. 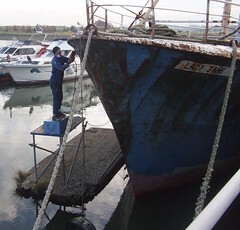 What I had done the previous day, before the tide went out, was to move the platform right to the back of the boat, to stop the tyres, which I'm using as counter weights to allow the platform to move up and down with the tide, from messing up that day's fresh paint on the side. I don't know for sure, but I think the platform must have ended up under Lady Jane's stern, when the tide came in the workbench must have somehow got jammed underneath, then pushed over. Once the workbench was in the mud, the platform must have settled on top of it on the next tide, as all I could see was a small patch of blue in the deep, thick, black mud. Unfortunately the tide was coming back in, so I could not reach in to get a rope around the workbench to start recovering it, or even get a photo of it for that matter. Anyway, the platform is in such a position that I should be able to reach the workbench next time I'm there and the tide is out, though I already know this will not be easy, as the bench appears to have been squished into the mud sideways and it's pretty heavy. 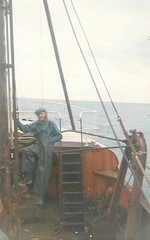 Here is a picture of a very much younger Paul on board the trawler he worked on. He also very kindly also sent me a picture the boat itself, LT66. 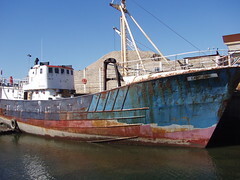 It's interesting to compare dear old Lady Jane with Paul's trawler, which used to fish out of Lowestoft, England. 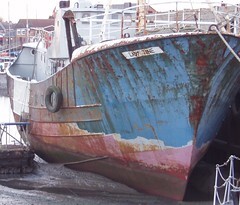 To my eye, at least, there are a huge amount of similarities between the two trawlers. Looking at these pictures, I can hardly wait to take Lady Jane out onto the high seas. 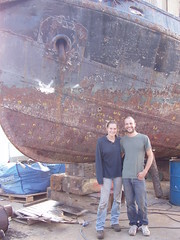 I'm still chipping rust from the bow section of Lady Jane. It's a massive area, far bigger than I'd first appreciated, and is taking a little longer to chip than expected. Here you see me working away right at the top of the bow section. What is weird though, is that Z.431 - Judith is emerging from behind Lady Jane. As I'm chipping away at the rust and old paint the name Lady Jane is disappearing and Judith and her Zebrugge registration number is beginning to show through, as her name and number were originally etched into the hull using a welder. I know I also have Zeebrugge etched on her stern in large letters, underneath her current Southampton registration, which is visible in some lighting conditions. I now need to decide if I want to keep the trace of her original name and number, or to get an angle grinder and erase all her original markings. As I said in my previous post, it becomes hard to remember how awful things looked once they've been painted. Click on the link to my last steering room post by way of a reminder. Since that picture was posted, I've rubbed the whole lot down, put primer on the walls and ceiling, sprayed the steering gear with primer and given the walls a first coat of white paint. I've still got to give the roof a first coat of white, then the whole lot a second coat. Once that is done, I also need to paint the pipes and brackets so the whole lot is looking smart. I'll finish the steering room with a coat of green, non-skid, deck paint. Oh yes, and before I go too far, I also need to remember to get the stern navigation light bracket welded back in place. 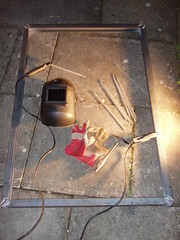 The light bracket was sacrificed as part of the job of welding up the holes in the back deck. That will impact painting both on the back deck and in the steering room. I know I've said many times that if I knew then what I now know, I'd never have bought Lady Jane. Not that I've got any regrets about buying her or anything. It's just that it's so much more work that I was expecting, needing such a big commitment in terms of time, effort and money. Maybe though, after fine days like we have just had I would still do it. Or is it that now the memory of all that rust is receding, and I'm feeling so much better about the whole thing? I don't know. Anyway, the onset of dusk provided an opportunity for a well earned break and a welcome cuppa after a full day of painting. My homework finally dried out, so I could finally get going with the gloss paint. My garage is now a complete mess, with newly painted white planks for Lady Jane standing around drying. 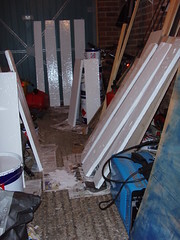 I don't doubt the paint is going to take quite a while to dry, as it's pretty cold in the garage. Ah well, it's a good thing I'm not in a rush for them. I got an e-mail the other day entitled "We didn't mean to either". It was from Ben and Gaelle who, by the sounds of it, are about to embark on an adventure very similar to mine with Lady Jane. It turns out they had done a search for 'rust removal' and found my blog. I'm sure all my regular readers will join me in wishing both Ben and Gaelle the best of luck with their new lifestyle! Work on Lady Jane took a back seat this last weekend. 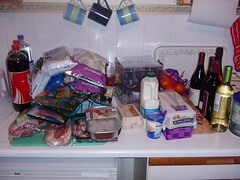 Saturday was the occasion of our annual Christmas dinner rehearsal, where everyone invited is given some aspect of a full Christmas dinner to cook. For those who's culinary skills are a bit lacking shall we say, there are always duties such as organising the cheese board. Needless to say, I got the port in. 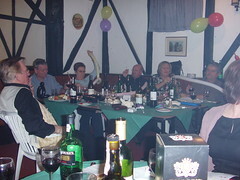 After the food, the entertainment consisted of jokes and stories, a quiz and various games, including messing about with balloons. As you can see from the photo, a great time was had by all. I know for sure I was not the only person taking it easy the next day. I'm continuing to make good progress with priming the hull, though the wet, cold weather and lack of daylight is starting to impact on progress. Often now, because of the cold, it's too wet to paint until well into the afternoon, then it gets dark so fast it's hard to see the paint properly. I've got most of the rust off the forward end of the starboard side, nearly all the way to the bow, and am almost ready to prepare this last stretch for painting with a wire brush. Stretch being the operative word here, as I just can't quite reach the very top bits, even standing with my wooden box perched end on, on top of the workbench. I know adding ballast would make the bow more accessible, but that project has taken a bit of a back seat for now. Fred suggested a bosun's chair but the problem, as I see it, is that this section overhangs quite a bit, so it would be hard to get to like that, especially if I'm working alone. I had started work on cutting longer legs for the workbench, which you can just see dwarfed against the side of Lady Jane. That will, as designed, give me that extra reach. Unfortunately it started to rain just as I started cutting, putting a stop to that for the day. Arriving down at Fareham just on high tide, I was greeted with a view of something a little different to the norm across the way from Lady Jane. Of course, I had to go for a closer look at this Landing craft. Apparently it has been on exercises this week. Not a spot of rust in sight anywhere! As it happened, I ran into Dave Hardy from Trafalger Yachts. A friend of mine, from the village I live in, has been on at me for a while to drop in and say hello and I've just never got round to it. 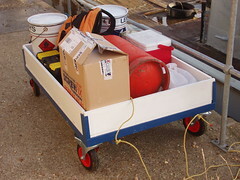 We soon got talking about paint and paint systems, as he is working on restoring a beautiful looking classic wooden boat. Dave is truly a mine of information and well understands my problems, as he apparently also has a steel hulled yacht somewhere in France. That Dave, who works right opposite Lady Jane, is a friend of someone else in my village is another unreal co-incidence. Ok, so I know it's yet another grim picture of Lady Jane but, asides for the galley which is bad beneath the portholes, I'm slowly getting all of the worst stuff dealt with. 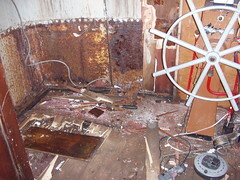 This one, taken recently, shows the state of the wheelhouse sides and deck just after stripping away the wood cladding. And no, I still don't know why there is an alumninium section at the front and top of the wheelhouse. I had a good idea it would be like this, as the rust from here has been staining my new paintwork outside, but still the shock of seeing daylight underfoot through the deck has taken some getting used to. I was not planning to start work on the wheelhouse so soon, but Shaun came down to help so I took the opportunity of cracking on with this. It was too damp to work on deck projects and painting inside was hampered by condensation issues. I need to make sure I have below decks projects that don't involve painting, for folk who come to help. Most of the things I've got saved up are jobs like stripping the cylinder head on the donkey, which is difficult for non engineering visitors to get stuck in and help with. 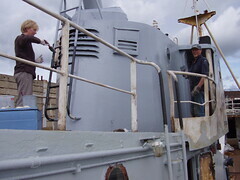 There is always cleaning to be done, especially in the engine room, but I do feel guilty giving people cleaning jobs to do. Still, I suppose it's got to be done. 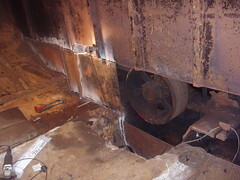 We are making good progress in the restoration of the engine room bulkhead. This was all started as a result of leaking diesel, from one of the forward diesel tanks, through a very rusty bulkhead back in early July. Robin is justifiably proud of his welding job, especially that section right down in the bilges there. My role in this has mainly been stopping enthusiastic helpers from chipping rust outside the hull while Robin is working inside. It won't be long before I get in there and paint that steel. As work on the steering room is drawing to a close, so the focus on working on the aft accommodation is growing. Most of the steel in the aft accommodation is in extremely good shape, with big sections completely rust free and like new. Unfortunately however, like so much on dear old Lady Jane, there are a few places with 'issues'. 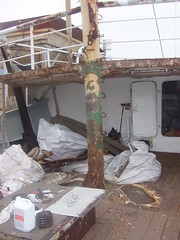 The picture shows a section of plate from both above and below decks which has rusted through into the aft accommodation from the deck above (click on it for a larger image). The pipe you can see is the drain from the shower room above. The box at the end is a one way valve, which stops sea water from sploshing back up into the shower room. 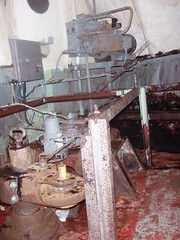 This, along with the two other valves in the stern accomodation, sink and toilet, will also need servicing. Due to a fairly recent liberal application of bitumen, the rusted through bit is dry at the moment. Thank goodness. I still need to remove more planking to expose the rusted section. Though I can already see that this is going to prove a big headache, as the rusty steel extends beneath the concrete which lines the edge of the deck. 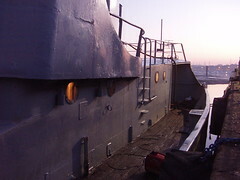 Firstly I will need to cover the entire deck, to stop water from elsewhere seeping into the accommodation space through the hole which will inevitably be exposed on deck while this work is done. I will need to dig out the concrete from the edge of the deck to get to the underlying steel. 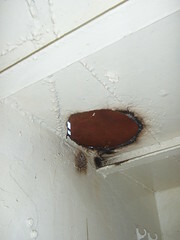 This will then need to be replaced and sealed against any further moisture getting in. I will need to take up more planking from the deck, to get to the steel below. Again, this will need replacing and sealing. I must say, I am very tempted to simply overplate this section and rely on sealing up the deck against any further moisture getting in as effectively as possible, as I would need to do the sealing bit anyway. Working on Lady Jane is, surprisingly, often quite a sociable occasion, with friends over to help and occasional, welcome, visits from the likes of Paula, who comes down to survey at the yard. The small marina across the way from me is also the source of a steady flow of shouted questions, comments and, occasionally, advice from the various boat owners and visitors there. Just recently Paul, who you can see here in the picture, shouted across some comment about the progress I'm making with the painting. Apparently he had worked on a trawler in the North Sea and Iceland. With the opportunity to meet someone who had actually been there and done it, I immediately invited him, and his friend Pat, on board for a look around. 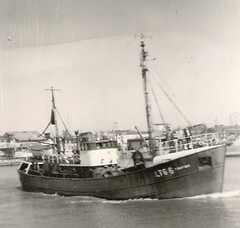 As it turned out, Paul had worked on a very similar trawler out of Lowestoft, England. I found it amazing to hear him describe how the various bits of machinery, now mostly removed of course, were used. Obviously, even though Lady Jane (Z431 Judith) was from Belgium, the methods used when trawling are almost exactly the same. Meeting Paul, I immediately get the impression he is someone who has been a lot of places, and done a lot of stuff. In the short time he was on board, reminiscing, he had plenty of interesting stories to relate. 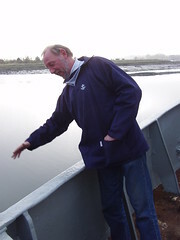 In the picture Paul is describing how, as trawlermen, they would get soaked when retrieving the nets from over the side, as the trawlers would be quite low in the water and beam on to the waves. I very much hope we get to hear more from him. I brought some more homework back from Lady Jane. 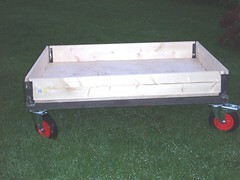 These are planks of wood, which together make up a box which the steering gear sits in. 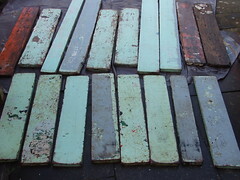 I also have a set of planks which I will use for shelving in the steering room. The plan being to clean up the wood with the jetwash, then give them all a lick of paint. The big problem I have at the moment is the cold. The hosepipe and the jetwash were both frozen, so it was late in the day before the wood even got cleaned up. I finally had to resort to defrosting the jetwash indoors. Now, with it still being so cold, the wood remains obstinately wet. Painting has been out of the question so far. My garage has no heating, and even I draw the line at taking bits of timber into the house to dry. Maybe it's time to get a heater for the garage. In any event, this particular homework project will just have to wait until the wood dries out. 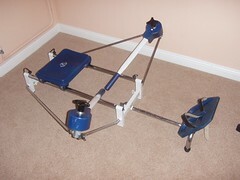 When I first bought Lady Jane I was told there was a rowing machine somewhere in the steering room. There was so much stuff piled in there I had not really paid much attention to it, other than being aware of an old hessian sack full of steel rods and things, which I presumed was it. When I had to clear the steering room, so the back deck could be cut and welded, I dragged the sack out and decided to take the rower home for a closer inspection, rather than put it into indefinite storage. The next day, in the privacy of my home, I put the thing together and gave it a try. A few hours and a couple of photographs later, it was for sale on eBay! Phil, who bought it a while ago, finally came round to pick it up this weekend. He plans to use it as part of an exercise routine, recovering from a car accident. Good luck to him. A few more quid for paint. Fred has stuck with it, continuing to help on Lady Jane. 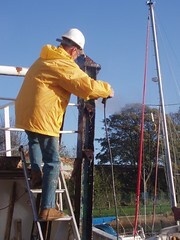 At present Fred has taken on the job of rust busting, using a selection of rust chipping tools. It's not always possible to reach into some of the tighter spaces with a chipping hammer, so here Fred is experimenting with my pressure washer. It takes the paint and rust flakes off ok, but does not seem to get the tough rust out. The search for the ideal rust removal tool continues. The current favourite being a masonry chisel on the end of a broom stick (more duct tape). There is no doubt that I would not be nearly as far along with priming on Lady Jane without Fred's help. It has been cold, but dry. This has meant I've made good progress with getting more primer onto Lady Jane. Here you see a relatively small, but very significant, patch of primer on the hull. Provided the weather holds, I'm planning to grow that patch significantly over the coming weeks. It's getting the first coat of primer on which is proving to be the toughest job, on account of all the preparing of the underlying steel which has to be done. Once primed, the actual job of Painting Lady Jane should progress fairly rapidly. Weather permitting of course..
With all that rust finally beginning to disappear, I'm feeling so much more positive about this whole project. This really motivates me to get on and achieve even more on board. Of slight concern is that no matter what I do, in some places I get small patches of rust seeping back through the primer, for no apparent reason. This last few weeks I've been noticing a lot more swan activity on the creek than usual. 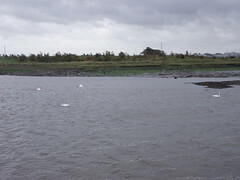 Just the other week there were six swans a swanning about, but George saw them off. Swans apparently pair for life, so presumably this is the time of year for pairing and finding a nesting site. Here you see a group of four swans which were gliding by behind Lady Jane. I tried enticing them closer for a better picture using McVities orange flavoured chocolate digestive biscuits, but they were having none of that. I know swans like bread, but I thought something a little more up market would have them flocking to me. Obviously they had more important things on their minds. At last! - I've got a coat of primer on the back deck - a first coat at least, though you can see the stern part has had a second coat, as it's looking a bit shiny there. Looking back, this particular project started six months ago. I was expecting something pretty straightforward then. Early in July I discovered the neighbours did not appreciate the sound of my air hammer on the weekend, so I had to do the noisy stuff during the week. Right in the beginning of August, I was aware of a few holes in the deck, which I temporarily covered with Duck Tape. At that point, I had the back deck almost completely stripped and was hoping that the welding that needed doing was not going to be too much of an issue. Later in August, I got around to busting the last of the rust from the back deck near the wheelhouse doors, a task which was slightly harder than I first thought. In the beginning of September, the first of the holes were patched. 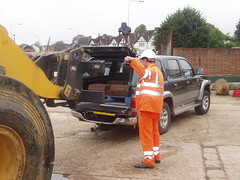 The knock on effect of this being I had to empty the contents of the steering room, so as to get the cutting and welding done safely. During September I was discovering just how much disruption the back deck project was causing, as I had to strip the galley ceiling. Towards the end of September we had pretty much all the holes in the galley roof welded shut. Early October saw me removing the plumbing I had previously been so proud of, to enable the hole in the shower room roof to be repaired. The last of the welding on the back deck was finally completed during October. 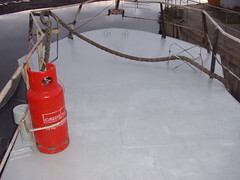 Since then I've wire brushed the back deck, again, and have now got that all important first coat of Hempel primer on. I've been working on cleaning up and painting the steering room, which is tucked away in Lady Jane's stern. This room also doubles as a store room which was hastily cleared when we started patching the holes in the back deck. In the grand scheme of things, once the welding on the bulkhead is complete, we can start work on the anchor project, which means I need to clear out the forward storage hold in preparation for cutting and welding all the necessary stuff to install the anchor and winch. All that stuff in the hold has to go somewhere. 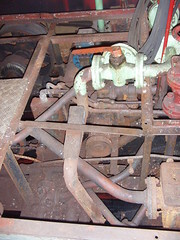 Here you can see a picture of Lady Jane's steering gear. Right at the top of the picture you can see the motor for the hydraulic system, with the pump itself just behind it. With this system Lady Jane can be steered electronically, though I've still got to get one of the solenoids sorted out. At the moment, using the electronics, she can only make turns to starboard. Looking at the state of the antiquated auto pilot system, I'd be surprised if it worked at all. To be honest I've no idea how to test it, asides for simply giving it a whirl when I finally get to take Lady Jane out for a voyage, possibly during summer 2006. You can also only just see some grey hydraulic pipes all the way to the left of the picture, these run up to the wheelhouse and provide the steering via the wheel in the bridge. 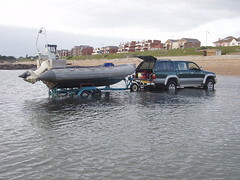 This system works perfectly fine, and is what we used when we brought the boat up from Southampton to Fareham almost a year ago now. I also have a huge big lever which fits over the rudder axis - the big brown lump you can see at the front left of the picture, this can then be used to steer Lady Jane manually if all else fails. I'm not so sure I'd like to try it though. 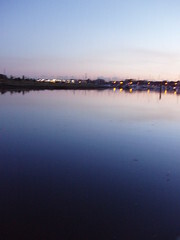 It was one of those moments, with the day's objectives well in hand and a nice cuppa tea to hand, the view down the creek at dusk perfectly reflected my mood. This is as close to pink as it gets Karen. 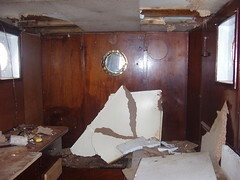 I've spent some time clearing the debris which has been accumulating on deck, much of which you can see in this picture. 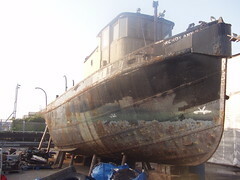 The debris consisted of a mixture of stuff, including rotten wood, concrete and steel from the fish hold and flakes of rust and old paint, the result of chipping rust from Lady Jane. There is still plenty more to come out of the boat, starting with more wood from the stern accommodation when I take the rest of the ceiling and then the floor out. Unfortunately clearing the debris, along with topping up the fresh water tank in the stern of Lady Jane, has had the effect of canceling out the last load of ballast I'd put in a few weeks ago. Lady Jane's bow is now riding higher in the water. The deck does looks so much better without all the clutter, so the effort has been worth it. It's a no from the BBC's DIY SOS team. Apparently they think a project on Lady Jane would be too much work. Ah well. It was always a long shot, but worth a go. Not that I'm bitter or anything, but Pudsey is getting nothing from me this year. I'm now the proud owner of a new sheet of 4mm steel, and it feels curiously good. 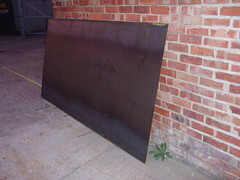 The thing with my new sheet of steel, unlike the stuff I bought for the bulkhead, is that it's been ordered for no particular purpose, other than unspecified future projects. Now I know that not everybody is likely to be too excited by this, but to me the possibilities are endless. I suppose it must be a little like a clean piece of paper to a writer, a new canvas to a painter, or even a new program to a developer, in that I get to actually create something from this blank sheet. On a more practical note, I feel a brand new hatch cover coming on, to replace the rusty old one covering the fish hold at the moment. I took the opportunity of a break in the recent wet, windy weather to hose down my deck with salt water, using the bilge pump and a new hose I've bought. Salt water is apparently good for the deck planks. Just as I was finishing hosing the deck, the donkey engine started making even more noise than usual. A quick dash down into the engine room showed the exhaust manifold had worked it's way loose. A loose exhaust manifold presents no real problems to fix, but closer inspection of the front exhaust port reveals a build up of carbon which should not be there. It looks to me like the exhaust valve is probably at fault, which would explain the reduced compression in the front cylinder that I've been aware of ever since buying Lady Jane. My thinking is, as the exhaust manifold is off anyway, it's time to give my faithful old donkey engine some tender loving care, and sort out the exhaust valve issue at the same time. It is, after all, one of the ways I produce my electricity. 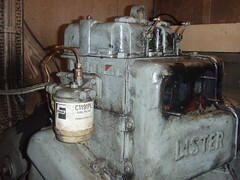 For those who are interested, the donkey engine is an air cooled, two cylinder 21.5 HP Lister. Although a little noisy, it has so far proved to be very reliable. Hopefully, as so often seems to be the case, this does not lead to more problems. 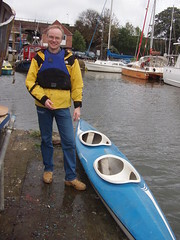 Here you see Andy posing beside the kayak which has been kicking around on Lady Jane's deck ever since I bought the boat. It's mostly just been getting in the way. I've been calling it a canoe all this time, but have now been put right on that one. I've only had it in the water once before, to investigate the platform which you now see alongside Lady Jane. Andy is a keen canoeist, so was up for taking the kayak out for a proper spin. Not even one minute into our adventure down Fareham creek we were suddenly both grateful for our life jackets. Not that we tipped over or anything, but it was very very close! Asides for the occasional perilous wobble, with accompanying splash of cold water, steering the thing was our biggest problem (mainly my fault). Anyone would think we had been down the pub before we set off. We got back to Lady Jane some time later, tired and pretty wet - despite the waterproofs. It was fun though, and I'm resolved to get some proper covers for the top of the kayak (spraydecks I think they're called), so I don't get so much water in, and give it another go. I've not said too much about the engine, or any engine room operations for quite some time. This has mainly been because I've got so much else going on and the engine is in pretty good shape, relative to the rest of Lady Jane, so is low priority. The engine does need to be started, and run, from time to time though. I try to do this about once a month, though I suspect with winter coming on I'll run it more often as it's a great heater. For a while now, I've known of a small diesel leak in the return pipes from the injectors. I finally got to have a look at this a little more carefully. 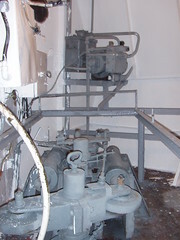 The diesel is stored in one of four tanks in the engine room. These tanks are only for storage, and do not feed either the main or the donkey engine directly. To get fuel to the engines, diesel is pumped up to what is known as a 'day tank', this sits above both the main and donkey engines. Diesel is than gravity fed, through filters, to each of the engines as required. Any unused diesel fed to the main engine is circulated to a smallish diesel return tank, below the engine room deck plates, from there it is pumped back up to the day tank by means of a continually running fuel pump. This is the normal mode of operation for the pump when the engine is running. To pump more diesel into the day tank when it gets towards empty, one of the four fuel tank valves needs to be opened, depending on which tank is to be used, and the diesel is either manually pumped into the tank, or is pumped using the diesel return pump by setting a valve to the correct position. Once the day tank is full, the fuel tank valve is closed and the retun pump valve is set back to the normal running position. You can see the diesel return pump just to the left of the picture. The problem I have is that the diesel return tank is full, hence the leaking pipe. What I don't know at this stage is if the pipe from the tank to the pump is blocked, or if the pump itself is broken. I'll need to run up the main engine again, with the valves set to pump diesel from the main tanks, to work out what the problem is. Either way, as you can see, it's going to be a dirty job to sort it out. Paula, who came to survey the yard, caught Robin and I sitting about on deck, drinking tea and trying to avoid doing any work. To be fair, I had been rust-busting on the outside of the hull and Robin had just arrived to help with welding on the back deck. At that point the sun was out and it was very pleasant to just sit about and chat. Later on in the day, after some welding on deck, conditions became unpleasant with a cold wind picking up from the south, so we opted to visit (H)arry Pound's. Arry Pound's, which is essentially a ships breakers yard, is an amazing place on a scale which is hard to imagine. It is apparently a shadow of it's former self in busier times when the military was actively downsizing. The scenes outside, with people standing, shrouded in smoke, cutting up massive sections of some poor ship lying in the dirt, is reminiscent of a Steven Spielberg movie set. There are anchors and the detritus of ships from a bygone age scattered everywhere. I also saw old army tanks, beat up cranes and ships and boats of all sizes. There are even a few submarines tucked away somewhere. Inside the massive warehouse there are rows and rows of all sorts of interesting 'stuff' stacked right up to the roof, all covered in layers of dust gathered over the years. A true grown boy's heaven. I truly doubt that anyone knows exactly what's in there anymore. Most, but not all, of the stuff is ship and boat related. Everything is for sale. The point of the visit was to find some much needed ballast for Lady Jane. 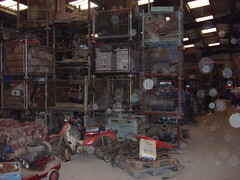 After enquiry, and some rummaging around, we found some three and a half tonnes of the stuff. 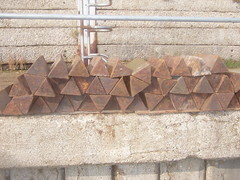 Toblerone shaped pieces of cast iron, apparently out of submarines, each weighing exactly 18 Kilograms (roughly 40lbs). The 'Toblerone' ballast is perfect for what I need, being light enough to manhandle down into the confines of Lady Jane's bow, but shaped so it can be packed in neatly and securely. I don't think that three and a half tonnes is nearly enough, but it's a start. Now it's just a matter of getting it all from arry's into the bowels of Lady Jane. This photo montage shows the transition from O 431 Judith, a North Sea fishing trawler, to Lady Jane, a partly converted live-aboard. Believe it or not, they really are all pictures of the same boat. If you are interested, click on the image, then click on 'all sizes', then click 'original' to see the detail. 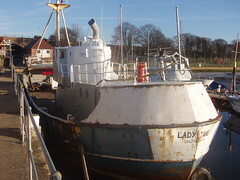 The first picture must have been taken when she was still being used as a fishing trawler. 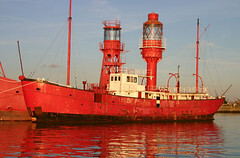 The second must have been taken when she was first moored in the River Itchen. 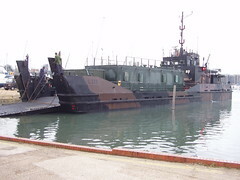 The third was taken in the Solent, when I brought her round to Fareham. 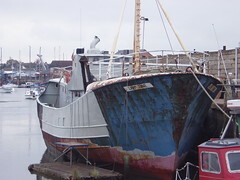 The last one was taken in Fareham a few months ago, after I had spent a day rust-busting on the hull. I am grateful to Jean-Pierre Van Elverdinghe for sending me more pictures of Lady Jane, including a few black and white ones which must have been taken when Judith was practically brand new. I am hoping to add another picture in the series, showing Lady Jane completely painted in grey primer, with no rust showing, before too long.